The Rainbow HeartStrings quilt was bound and labeled a few days ago but this was the first chance I had to photograph it. Pantograph is Steam and it’s UFO #17 finished this year! An unexpected overnight visit to the other FL coast leaves me behind but I did get started on my packing for Maine – lots of sewing stuff, quilts, Finn’s food, meds, clothing, crate … our clothing, knitting stuff, a sewing machine and a tying table … the car will be packed to the gills! Just two more days to get it all together! 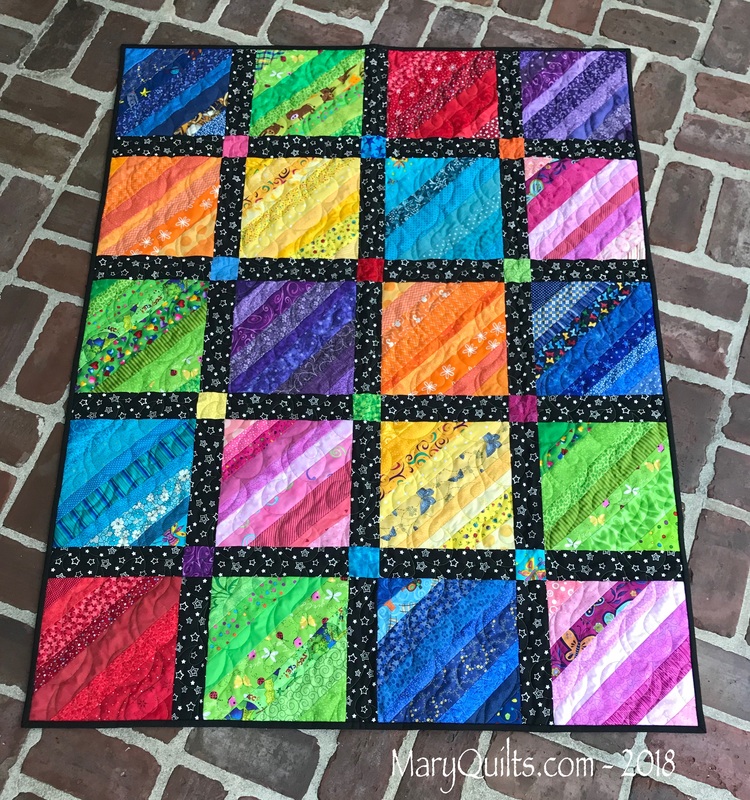 The starry sashing pulls the eye to the blocks and the colorful cornerstones: it’s a gorgeous quilt. This quilt is so pretty. It’s cool in the St. Louis area, fall had arrived here. I expect Maine will be much cooler too. Oh What a fun quilt! Thinking of you and hope you are feeling well. I know you get your inspiration from Ebay — I get mine from going through your photos. I’ve made several of your quilts and this is going to be my next one. It’s beautiful! I’m sending Keith my strength and patience as he packs the car — it won’t be easy. Have a very safe trip! I love this quilt. I think the sashing you chose and the jewel -like cornerstones finish it off beautifully. Good luck with the packing. I find the older I get the more of a chore packing is….. and UNpacking is 100s oftimes worse! I really like that one! !